As fall approaches and the weather begins to cool, you should start thinking about home maintenance. With winter coming soon there are some checks that need to be done and possibly some adjustments made to prepare your home for the season ahead. Not sure what to do? Follow this checklist to get your home ready for winter. 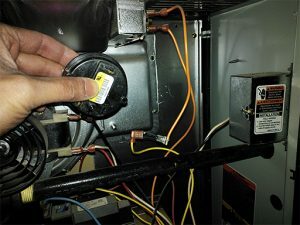 Furnace inspection and maintenance. It is wise to have your furnace inspected every year to make sure it is in good working order and will run efficiently. You can save money on energy costs with yearly maintenance and avoid unexpected furnace problems in cold weather. Heating system installation Eden, NC. If your furnace is old or is found to be faulty upon inspection, it may be in your best interest to replace it. Your HVAC technician can give you a recommendation on its condition and the best course of action. It is much easier to have your furnace replaced in the fall if replacement is necessary. Install a programmable thermostat. Save money this winter with a programmable thermostat. You can keep your home warmer when you’re home and cooler when you’re not at home to save energy and heating fuel. Roof inspection/repair/replacement. Have a professional roofer check the condition of your roof and do any repairs that may be necessary to keep cold air and moisture from seeping in. If your roof needs to be replaced, it’s best to get it done in the fall before winter weather sets in. Seal up cracks around windows and doors. If you notice cracks, seal them to keep cold air out and warm air in. Not sure how to handle this? Have a professional home insulator come and seal your home. Clean out gutters. Before frost, snow, and ice begin to form, clean out your gutters so that the water has plenty of space to drain properly away from your home. Divert water away from the house. Once your gutters are clean, consider extending your drain pipes further away from your home. This keeps water away from your foundation to prevent sinking or a flooded basement. Also, make sure your yard drains properly away from your home. Add a drainage system if necessary. Turn off exterior faucets and drain hoses. Keep water from freezing in pipes and hoses and causing damage by turning off all faucets and draining all water from hoses and sprinkler systems. The most important part of fall home maintenance is preparing your furnace. If your furnace is old, not working correctly, or requires expensive repairs, it may be in your best interest to replace it. Carolina Fuels provides reliable heating system installation in Eden, NC. An experienced technician can evaluate your heating system and determine if a replacement is necessary or recommended. If you are in need of a replacement, Carolina Fuels offers specials and discounts to make it more affordable. Call (336) 623-9741 to schedule a furnace inspection today.